Righting past wrongs takes innovative solutions and partnerships between the right organizations. What if those wrongs are over a century old? That was the case for a recent environmental remediation project. A Mahaffey Tension Series (MTS™) structure engineered for quick installation and easy expansion was the answer for this project that was so crucial to the surrounding community. A large project was recently approved to remove coal tar from the site of a former gas plant and ultimately to restore a river to an environmentally safe status quo. A professional environmental remediation solutions company from New York was hired to manage the dredging operation. 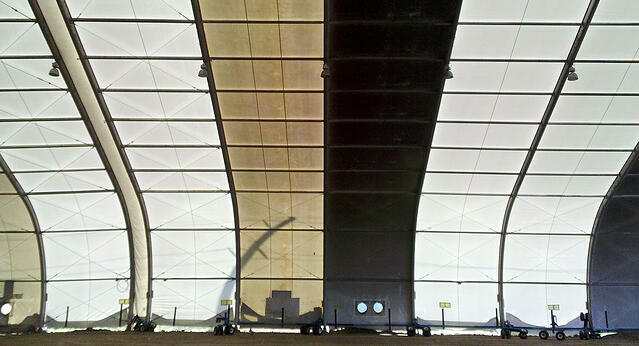 To facilitate progress, the company required large processing and storage tents on site. They asked Mahaffey to join their team because of our expertise in environmental structures and safety. The dredging operation required two different temporary Clearspan structures: One to serve as a staging area for processing contaminated soil and preparing it for transport to a designated area, and another for storage, where clean soil would be kept until needed. These structures also needed to be built quickly to accommodate the requirements of other contractors and adhering to the project regulations. Mahaffey has over twenty years’ experience helping environmental remediation companies provide innovative site shelter and containment solutions for major environmental projects. The Mahaffey Tension Series (MTS™) was no exception. MTS™ structures can easily be relocated or expanded, and they are designed to be crane-lifted (if needed) to even the most hard-to-access sites. Project Manager Joe Berger offered expert guidance in selecting this containment solution to help improve efficiency, optimize productivity and minimize public disturbances. 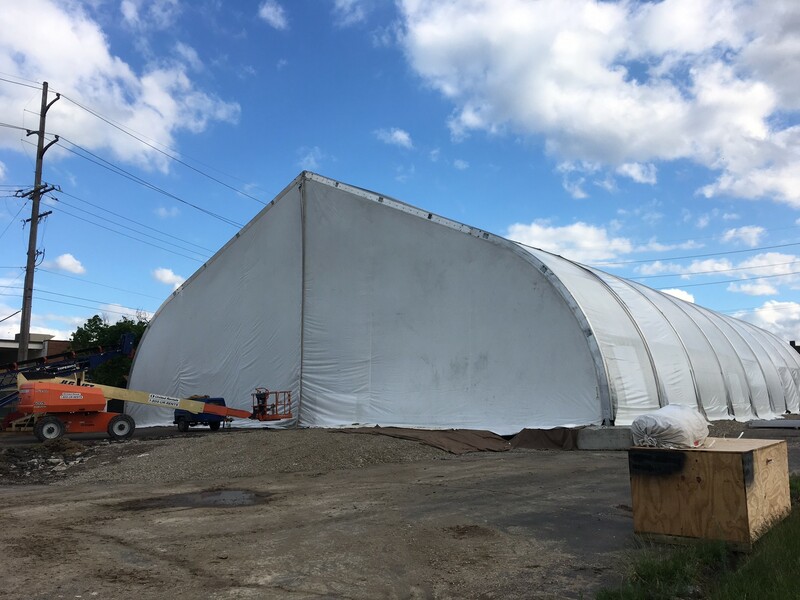 Our final recommendation included two MTS™ temporary structures: a material processing and loading structure measuring 134’ x 260’ and a material storage tent measuring 96’ x 150.’ Each structure was located on an asphalt pad provided by the client. 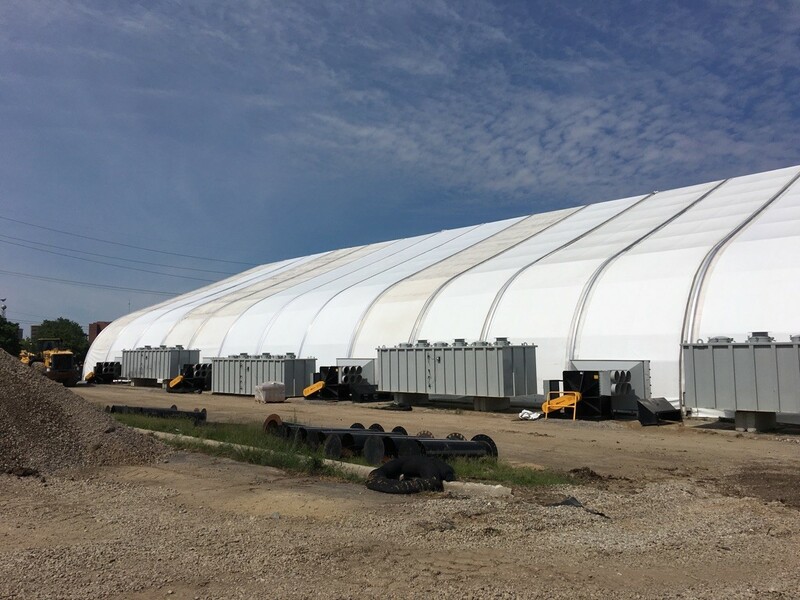 The temporary structures included personnel doors (3 on processing structure and 2 on storage structure) and cargo doors (3 on processing structure and 2 on storage structure) as well as openings for an air purification system. While no major obstacles occurred over the course of installation, Mahaffey was required to adhere to an accelerated schedule. Our team completed the structures within three weeks. The client continues to be very happy with the results. Mahaffey’s temporary structures will be on-site through completion of the project. Keeping the public safe during environmental remediation projects is critical. Projects of this nature require creative problem solving, deep experience and dedication to safety and the environment. 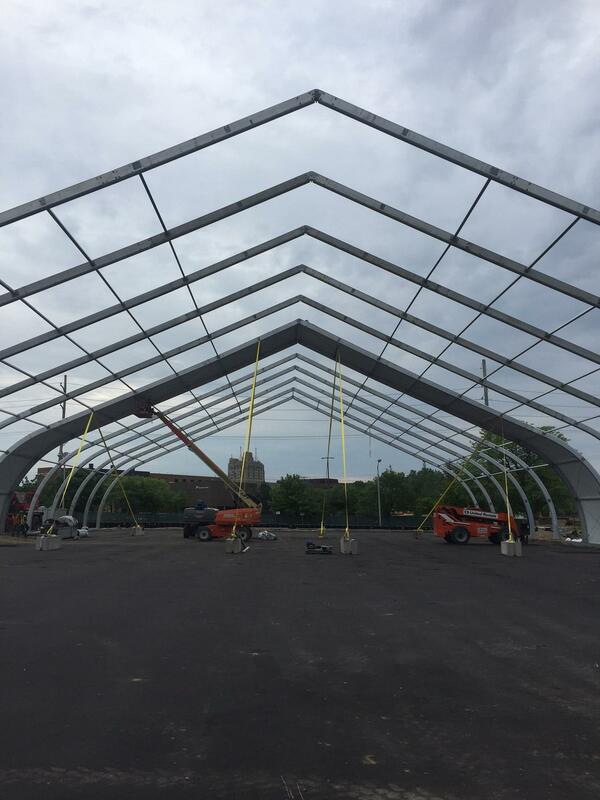 Mahaffey’s engineered temporary structures provide secure, safe shelter for even the most challenging needs.